Are you looking for an easy, festive, and unique appetizer to serve at your holiday party? Of course you are. Everyone is! Well, look no further. Cucumber, Whipped Feta, and Sun-Dried Tomato Bites are here! The whipped feta is the star of this dish. I could eat it by the spoonful! I love the burst of red from the sun-dried tomatoes, and the freshness from the cucumber. These are bite sized and healthy, so no need to feel bad about the fact that you can’t stop eating them. Perfect straight from serving tray to mouth. Guests will go crazy for these little cuties, so be sure to make plenty. To further simplify this dish, the whipped feta can be made 2 days ahead of time and stored in your refrigerator in an airtight container. Shortly before your guests arrive, slice up your cucumber, and assemble. Voila! A healthy, delicious, light, and pretty appetizer to serve your guests! First, make the whipped feta. Combine feta cheese and cream cheese in the bowl of your food processor and pulse until cheeses are well blended. Add olive oil, lemon juice, and black pepper, pulse again until whipped and smooth. Adjust seasoning to your taste, add salt if necessary (I did not add salt to mine). 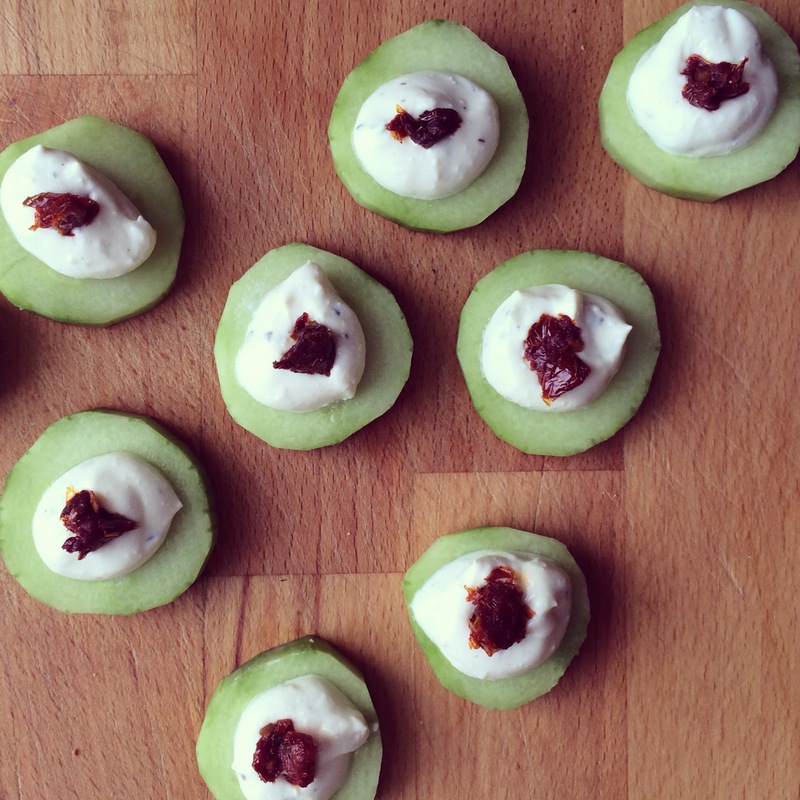 Place cucumber slices on serving tray, top with a dollop of whipped feta and a piece of sun-dried tomato.